Dina Kowal Creative: Your story. I put this simple card together just for fun this weekend, with things laying on my desk. That's always fun - some of my favorite cards have happened that way! The background is a piece of watercolor paper that I used to mop up my palette after shooting last week's tutorial video... there was plenty of good ink left there, so I just misted it with water and laid the paper over the palette to lift... dried the panel, and then kept dabbing and drying for a distressed look. The horizontal panel is a paint sample... so one of those colors is similar to the one in our boys' future bathroom... The panel is mounted on a 2" x 4" Art Swatch from Inchie Arts - the matboard makes a nice sturdy base, which helped the paint sample stand up to a little sanding. This sentiment is one from my Fall/Winter release... it's inspired by a line from the song Glorious Unfolding, which really encouraged me during the last couple of years of uncertainty. 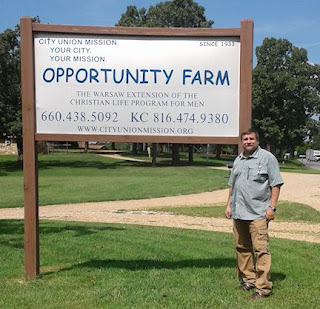 It also really speaks to this new phase of life, as Russ works with men who have been through difficult circumstances and are looking ahead with hope to a new start with a living faith. Everyone has a story... be encouraged to know yours isn't over yet! Have a wonderful week! Dina, as I turned on my computer this morning & saw your post, I was touched by the sentiment on your card! I finally found time to sit down here & read your post this evening. I am about to speak at our women's group at church & share my testimony.... I read the words of Steven Curtis Chapman's song... (I like his music too!) But, just wanted to say, God is soooo good! I have been preparing this message for over a month & know that God is in it! It is wonderful to see God at work in others, in you & your family! Blessings on your new adventure!!! ;)God is good!!! Great card. My first see was a face in the blue ink...I thought at first it was a Halloween card. Do you see what I'm seeing?